Senri Miyaoka, a Japanese engineer, was born in Buenos Aires, Argentina, in 1937, where his parents were living for business reasons. He came to Japan the following year and has lived there ever since. From his childhood, he liked to make or invent things and particularly enjoyed repairing radios. As a result of his childhood interests he later chose to study physics at the Gakushuin University, Tokyo, where he earned his B.Sc. degree in 1959. Upon graduation, Mr. Miyaoka had again to choose which direction his life would take. He has liked music and played the cello while at college. He also belonged to the university orchestra club and, was a member of a private orchestra. Because of his interests in music and physics he chose to join SONY Corporation in 1959, since the company has a particularly high reputation in the field of audio-visual electronics and also for the breadth of their research efforts. At this time development of the transistor had only just begun, and until the end of 1961 Mr. Miyaoka was involved in the development of high-frequency power silicon transistors for television receiver applications. While doing this work, he felt he was helping to produce one of the really new, superior devices for the world. In 1962, he became involved in the research in various types of color picture tubes. The conception of the then innovative but now well-known 1-gun, 3-beam electron optics system of the TRINITRON color T-V display tube was born out of his devoted research efforts. 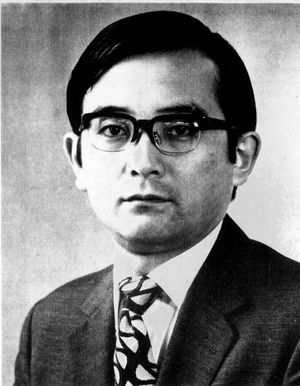 Senri Miyaoka was manager of television tube development at SONY, and efforts toward better electron optics for TV CRT's continue to be his greatest challenge. He has published several papers in the field of color television and has many patents in Japan and foreign countries. In 1969, he received the Best Paper Award from the Broadcast and Television Receivers Group of the IEEE. He also received the Mainchi Industrial Technology Award in 1969 and in 1973 he was the recipient of the Okochi Memorial Technology Prize. He received the 1974 IEEE Vladimir K. Zworykin Award "For his contributions to the development of new concepts in color TV display tubes." Senri resided in Fujisawa City, Kanagawa-ken, Japan, with his wife, Hiroko, and two sons: Chitoshi, and Keita. This page was last edited on 15 February 2019, at 16:04.